The inspiration behind Third Leap was drawn from many sources. Regarding wild ales, I am specifically fond of Black Project’s perspective. Essentially, Black Project produces either “spontaneous” or “wild” beer, but the monikers vary quite significantly from current commercial brewery use. The “spontaneous” term is self-explanatory (beer made without adding cultured microbes whatsoever), but the “wild” term is more controversial. At the time of brewing these recipes, the only foraged microbes (either local or remote) available to me were yeast (not lactic acid bacteria). Additionally, my first lambic attempt was still conditioning, meaning that the spontaneous microbes were not yet available for repitching. Therefore, I opted to use repitched spontaneous microbes from commercial wild beers for the Golden Wild Ale and Amber Wild Ale. Fortunately, in late November 2015, I participated in a blind commercial wild beer tasting. 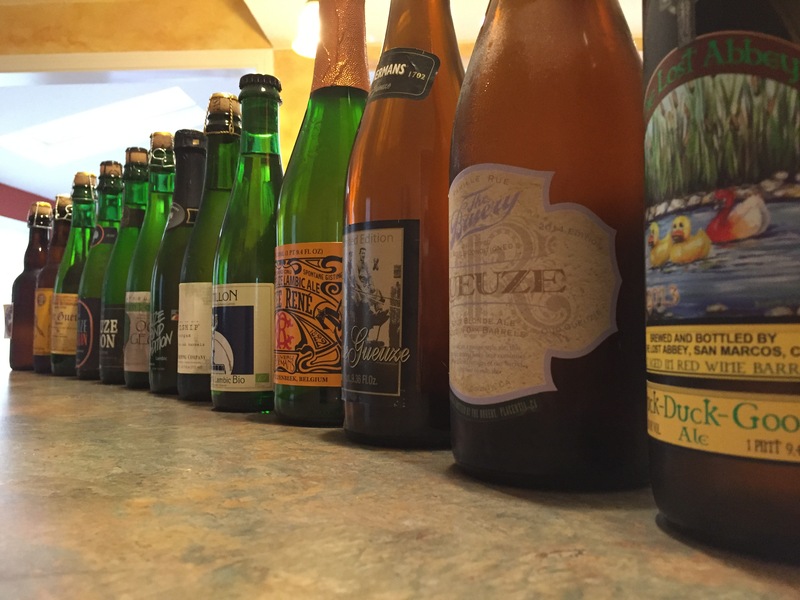 In total, 13 beers were shared including Allagash Coolship Resurgam, Boon Oude Geuze, Bruery Terreux Rueuze (not 100% spontaneously fermented as lambic), Cantillon Gueuze 100% Lambic-Bio, Drie Fonteinen Oude Geuze, Hanssens Artisanaal Oude Gueuze, Homebrew Wild Ale (not 100% spontaneously fermented as lambic), Lindemans Gueuze Cuvée René, Russian River Beatification, St. Louis Gueuze Fond Tradition, The Lost Abbey Duck Duck Gooze (not 100% spontaneously fermented as lambic), Tilquin Gueuze à l’ancienne, and Timmermans Oude Gueuze Lambicus. After each beer was poured, I dumped the dregs into sanitized 50 ml conical tubes and propagated the favorites for a split batch experiment. A few weeks later, I brewed 10 gallons of golden ale and 10 gallons of amber ale, and split the 20 gallons among one-gallon fermentors. Each gallon received a different co-pitch of house yeast and wild beer dregs, save one gallon of each which was left outside overnight for spontaneous inoculation (no yeast or dregs). I’m looking forward to trying the final products next year! Description: A complex, pleasantly sour but balanced wild wheat beer that is highly carbonated and very refreshing. Characteristic barnyard, horse blanket, and leather characteristics intermingle with citrusy fruity flavors and acidity. Description: A sour, fruity, red wine-like Belgian-style ale with interesting supportive malt flavors and fruit complexity. The dry finish and tannins completes the mental image of a fine red wine. Notes: Brewed solo on 12/30/2015 as back to back batches (Golden then Amber). Golden pH readings were 5.46/5.73/5.81/5.73 (mash/1st run/preboil/postboil) and Amber pH readings were 5.53/5.68/5.74/5.59/5.45 (mash/1st run/2nd run/preboil/postboil). No oxygen. One gallon was run off into a two-gallon, open top fermentor and moved outside for ~10 hours. The fermentors were retrieved early due to impending rain.The remaining 9 gallons was cooled and split among one-gallon fermentors. House yeast co-pitched with dregs. Fermentation began at 68°F, but was allowed to free rise during storage at room temperature. Consistent monitoring of the fermentors showed a peak fermentation temperature of 68°F over the first two months. Fermentation activity was evident in all fermentors 1/6/2016, except for the spontaneous inoculated Amber fermentor. In mid January, krausen from the spontaneous inoculated Golden fermentor was transferred to the Amber to initiate fermentation. Krausen was visible by 1/20/2016. Some pellicles also began forming at this time. In early April, the fermentors were moved from room temperature (upstairs) to cellar temperature (downstairs). The downstairs temperature was approximately 50-55°F in April.